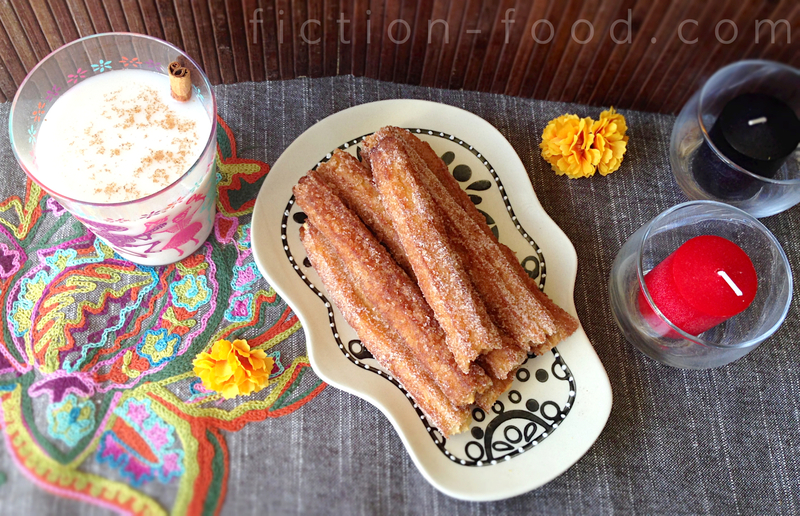 Fiction-Food Café: Cream-Filled Churros & Easy Horchata for "The Book of Life"
Cream-Filled Churros & Easy Horchata for "The Book of Life"
I've been so looking forward to "The Book of Life" movie–a Dia de los Muertos (Day of the Dead) themed film–and now it's finally here (10/17/14)! Aside from the awesome blasts of color, unique character designs and settings, and the focus on Story and themes of cultural traditions and beliefs, what stood out to me in the trailers was–you guessed it–the food! Specifically churros (click here for the proper pronunciation by La Muerte voice actress Kate Del Castillo). EDIT: I just got back from seeing this movie and holy moly is it awesome! It's full of color and action and meaningful lines and themes along with humor and tear-jerking parts, and Smalls, who is four, sat through the whole thing mesmerized. It's a film that both grown ups and kids will enjoy on different levels. The music is wonderful and the ending is wonderful and everything about it is wonderful! I definitely recommend seeing it! And this is one that will for sure need to be part of our movie library. Can't wait to see what kind of extras they put with the blu ray release. 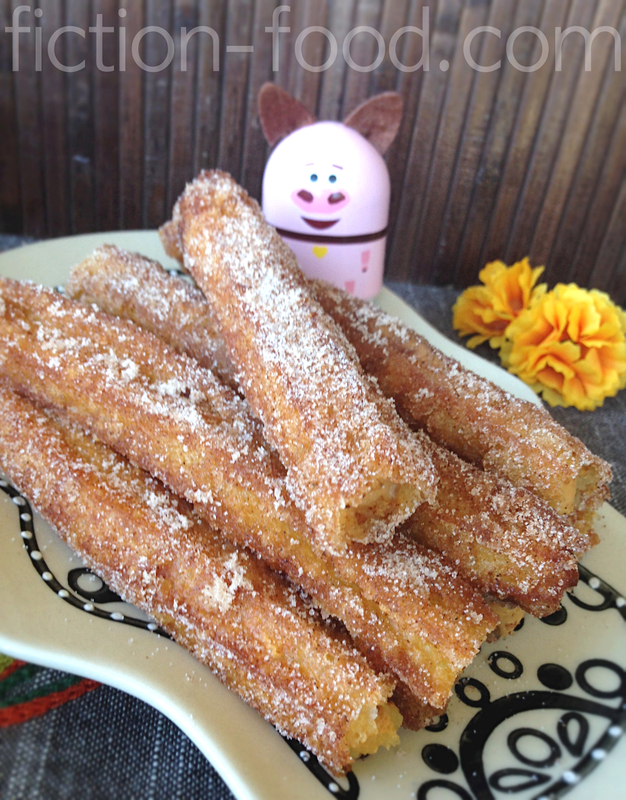 Note: The churro recipe below is made from a pâte à choux dough meaning it contains eggs and butter (just like my "Cucco Puffs" recipe) causing the end result of the churro to be crispy on the outside and soft on the inside. In Spain, aside from churros, there is an almost identical looking food called a porra that only calls for water, flour, and a little salt. It's often called a churro mistakenly because of its appearance. If you'd like to make something more like a porra you can omit the butter, eggs, & sugar from the recipe below, adding in a tablespoon or two of oil, and continue with the recipe as is. I used a decorating bag with a large Wilton open star tip attached to squeeze out the dough, but there is also a tool called a churrera (it's like a cookie press) designed specifically for making churros. The piping bag works just fine though! 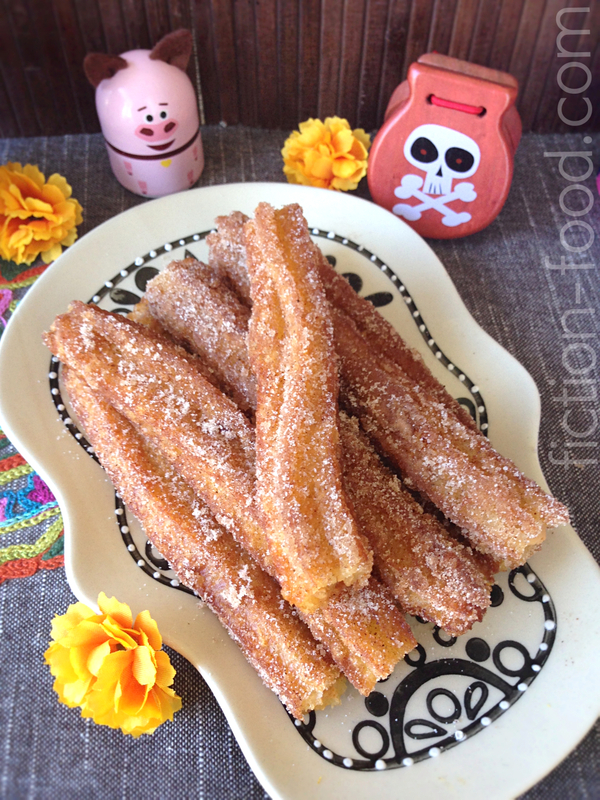 Also to note, traditionally churros are deep fried, but it is possible to bake them! Simply make them according to the recipe below but instead of piping the dough directly into the hot oil, pipe the dough strips onto a parchment paper-lined baking tray and bake in a 350ºF oven for about 20 mins or so, or until the churros are golden brown and crispy on the outside. 1. Place a mixing bowl (preferably metal) into the freezer. On a plate, combine the 1/4 cup sugar & 1 tsp. cinnamon & set aside. Line a tray with a few layers of paper towels to have at the ready. Pour about 2" of oil into a large/wide pan & let the temp rise to 350ºF (use a candy thermometer) during the next step. 2. Making the churros: Bring the water, 1 1/2 Tbsp. sugar, & butter to a boil in a large pot. Turn off the heat & add in the flour all at once, stirring until you get a smooth dough (the flour goes into the pot! Do not pour the liquid into a bowl of flour–you'll end up with something you can't use!). Next, add the vanilla & one egg into the pot. Stir until incorporated (use those muscles!). Add in the second egg & stir again until the mixture is smooth & no longer slimy. Spoon the mixture into the bag with the large open star tip. 3. Pipe ~5" strips of the dough, 4 at a time, into the hot oil, cutting the dough from the piping tip using the clean scissors (I piped mine longer & cut them afterwards, but smaller strips will fry nicer). Fry for about 1 minute & then roll over & cook 1 minute more, or until golden brown all over. Remove from the oil onto the paper towel-lined tray. 3. Making the dulce de leche cream: Remove the chilled bowl from the freezer & pour in the heavy cream. Whisk on high until it thickens & then add in the powdered sugar. Turn speed to medium low & continue to whisk. Add the vanilla & whisk until stiff peaks form. Turn speed to low & add the dulce de leche 1 Tbsp. at a time until you've added it all (half of the can). Scoop the cream into a baggie fitted with a thin piping tip. 4. 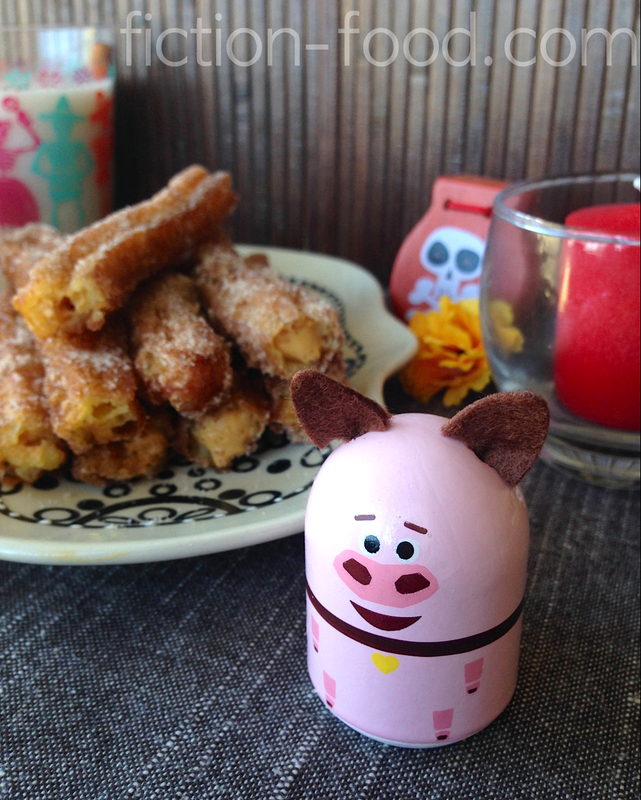 Putting it all together: Use a chopstick or skewer & poke the churros all the way through. Stick the piping tip into one end of the churro & squeeze the cream in until it starts to peek out the sides (you'll know when to stop). Pipe a little cream into the opposite end too. 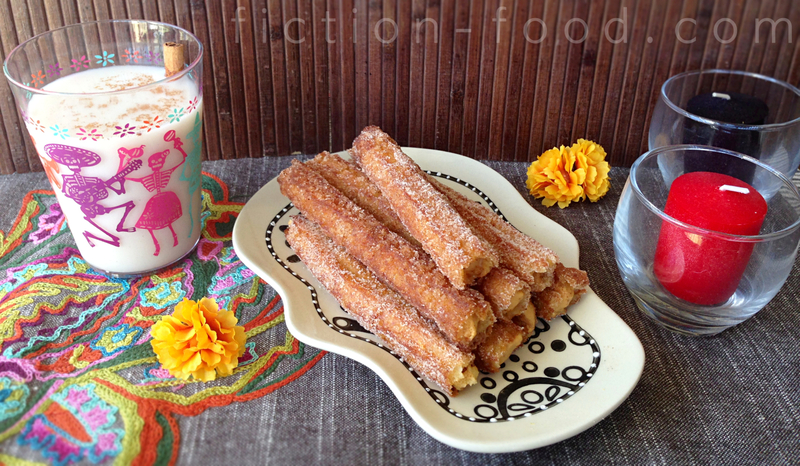 Do this to all of the churros & then roll them gently in the cinnamon/sugar mixture. Serve immediately. 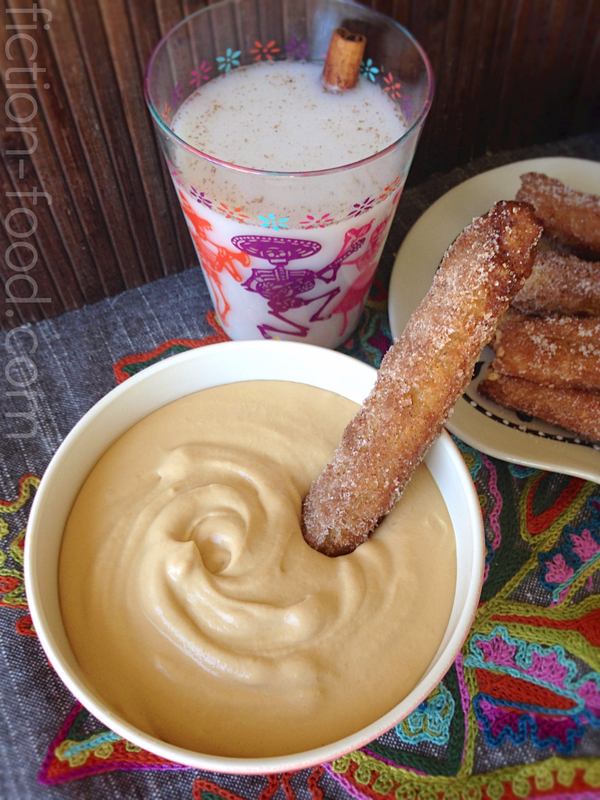 You can also forgo filling the churros & simply dip them in the cream! And beware: Do not eat any churros that are suddenly coated in white frosting! 1. Combine the rice milk, almond milk, & cinnamon sticks in a pitcher & stir. Set in the fridge for several hours or overnight. Remove the cinnamon pieces with a slotted spoon & discard (or dry on a paper towel to use for something else–they still smell good). Stir in the vanilla sugar syrup & test the taste–add more syrup if you'd like it sweeter. 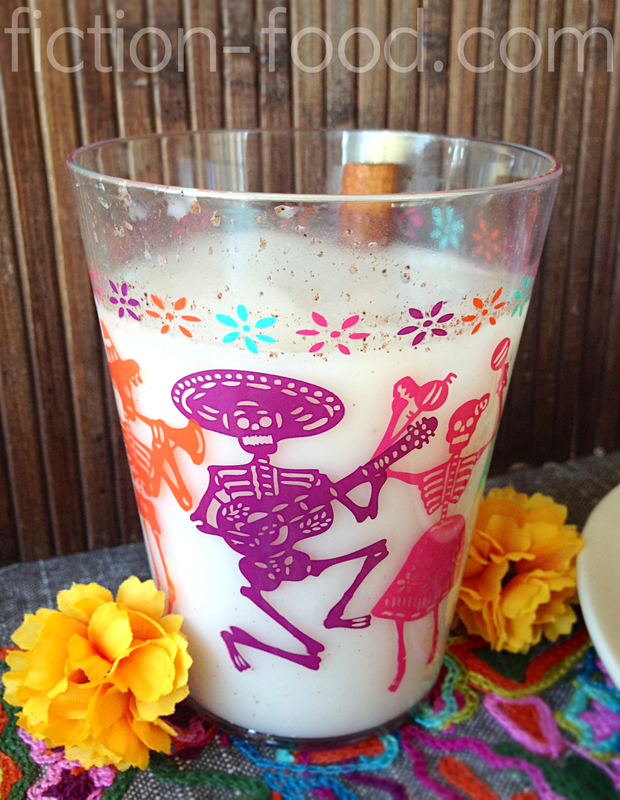 Serve the horchata on ice or warm it up in a mug. Garnish with a fresh cinnamon stick &/or pinch of ground cinnamon sprinkled on top. To be really extravagant, scoop a dollop of the dulce de leche whipped cream on top of a warm mug of horchata. To celebrate the premiere of such a beautiful film (in appearance and theme) I decided to do a giveaway of some fun items and a wonderful book! When I first read about "The Book of Life" and saw the first released images, a book and author instantly came to mind; the Señor Calavera book Just in Case: A Trickster Tale and Spanish Alphabet by Yuyi Morales. Ms. Morales is a multiple award-winning author and artist, self-taught, originally from Mexico and now living in America. Her artwork is a gorgeous rotund of color and her stories invoke emotion with poetic simplicity. I was lucky enough to meet Ms. Morales a few years ago–you can read about the experience here. 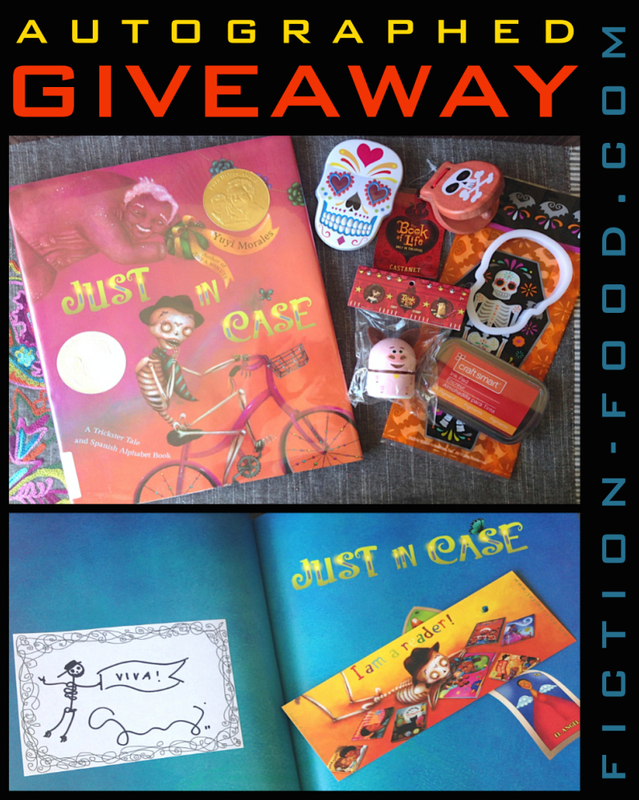 Along with a hardcover autographed copy* of Just in Case and a Señor Calavera bookmark, I'm giving away a "Book of Life" castanet (1), pin (not pictured), and a Chuy the pig stamp plus a red ink pad, along with a skull tin of candies, and a skull outline cookie cutter. To enter fill in the Rafflecopter form below. The giveaway is open to US residents only and will end on Monday Oct. 20th at 11:59 PM PST. Wow, those look awesome! To be honest I generally don't get excited about churros (or donuts...or jalebi...or pretty much any "sweet fried dough" foods), but I could eat dulce de leche on cardboard and be happy, so I love your version. I have also wanted to make horchata for a long time, may have to try it now! The movie looks great too! Thanks, Carrie! Yes, the dulce de leche whipped cream is amazing just by itself. Dangerous! And this horchata recipe is definitely a slap-dash version but it's good! The movie premieres this Friday and I plan on seeing it next week. All of the trailers and artwork and promotions are so fun and colorful–I'm sure it's an excellent movie! Oh wow your churros look amazing!! You've just given me a new pregnancy craving! Wow! pretty post. Really enjoyed reading it from start to finish and I am interest for your next post and you have any time Please visit my slab leaks page and leave comments.